Originally appearing at chicagotribune.com on Monday, Jan. 5, 2015. Oak Park may soon become home to Beer Shop, a combination bar and craft beer shop that would be unlike many others in the Chicago area. The proposed business is a combination bar and retail store at 1026 North Boulevard, the former home of Mephisto Shoes, which closed about six months ago. The shop will focus specifically on beers and related products from up and coming craft brewers who may not yet have space next to Anheuser-Busch InBev and MillerCoors products at grocery and liquor stores. King said he got a call about three months ago from one of the business’ owners, Tony Compaglia, asking about opening up Beer Shop’s retail concept in the Chicago area. Compaglia is a banking analyst who previously worked at Bank of America, Credit Suisse and Merrill Lynch. Before that he worked as an account representative with Vivendi Universal Games and a sales account manager with Ubisoft. On his trips to Chicago ahead of the move, he noticed that Beer Shop’s concept, which has appeared over the past five years or so in California, hadn’t hit the Midwest yet. That’s what prompted him to partner with a group of investors to open Beer Shop and also to start working stints at Caps & Taps, a California beer shop and taproom that already does what Compaglia hopes bring to Oak Park. While the industry’s big producers have dominated the market for decades, Compaglia said their sales have been flat over the last four of five years, while craft beer’s numbers as a whole have grown at a rate of 15 to 20 percent per year over the same period. “So [craft beer] represents anywhere between 6 to 10 percent of the industry’s sales now,” he said. Illinois has 83 craft breweries and on average produces 136,999 barrels of craft beer per year, according to data from the Brewers Association, a nonprofit trade organization focused on small and independent craft brewers. Oak Park also has a home brewer’s club with about 75 members. One of the club’s members, Steven Loranz, got village approval back in November to open The Noble Kinsman brewery on Roosevelt Road. “What we’re trying to do with Beer Shop is to provide a distribution point to the public where they can go to learn more about local craft brewers and purchase craft beer,” he said. However, before Compaglia can open up shop, he needs approval from Oak Park village officials. For Beer Shop to operate in Oak Park, the village will need to approve a text amendment to its liquor code to include “craft brew lounge” in the ordinance’s language, said Oak Park Village Planner Craig Failor. “They need a text amendment to have that use in the village because the business will not have a kitchen,” said Failor. Currently, all businesses that have a liquor license must also serve food. If the liquor code is amended, then Beer Shop’s owners will then also need to apply for a special use permit. The Village Board discussed the possible amendment in a July meeting. Back then, Trustee Peter Barber said it might be a way to increase the village’s economic development opportunities. Because of the pending amendment, Beer Shop’s owners have signed a lease for the 1,100 square foot storefront with a contingency for village approval. Because of this, he’s moving forward with construction on the premises and hopes to officially open sometime in the spring of 2015. Mephisto Shoes operated for almost 19 years in the space before closing shop about five months ago. Compaglia said the construction should be pretty straightforward, because there isn’t a lot they have to tear out and they aren’t building a kitchen on the premises. Because the business won’t have a kitchen, Compaglia said he hopes to partner with neighboring restaurants to allow his customers to order food and have it delivered to his business. 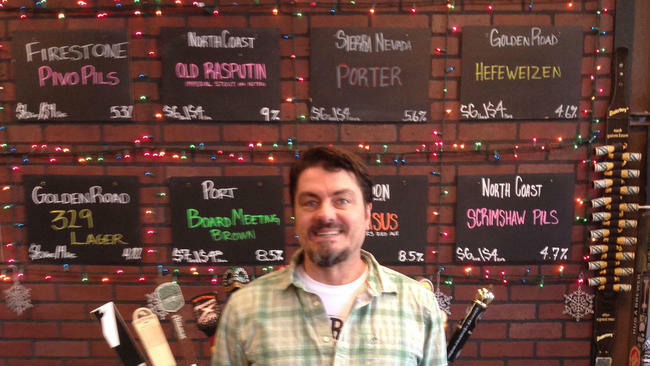 Beer Shop’s owners are expected to meet with the Oak Park Plan Commission on Jan. 8.